Multi-function pressure cookers are so popular because they replace multiple kitchen gadgets with a single, easy-to-use cooker. In the case of the Hohm 6-Qt Multi-Functional Pressure Cooker Pro, it replaces seven different crucial kitchen tools: it’s a pressure cooker, steamer, slow cooker, rice cooker, stock pot, saute pan and food warmer in one. It’s an awesome device that’ll make your food taste better than ever since it locks in all the flavor, and it’s on sale right now for just $80 if you clip the 11% on-site coupon on Amazon. 7 FUNCTIONS & 9 PRESET PROGRAMS: Pressure Cooker, Steamer, Slow Cooker, Rice Cooker, Stock Pot, Saute Pan & Browning, Warming Function | Use one of the nine micro-processor controlled preinstalled programs (Rice, Beans, Meat, Bones/Ribs, Noodles/Pasta, Soup, Cake, Porridge & Warming) or simply use the MANUAL MODE to customize the cooking time for any dish. EASY TO USE & EASY TO CLEAN: Simply add your ingredients, close the lid and choose your program – your Hohm Pressure cooker does all the hard work for you | 24-HOUR WARMING & TIMER MODE: Up to 24 hours delayed cooking & warm keeping mode | NON-STICK & DISHWASHER SAFE inner pot | Attractive & Fingerprint proof brushed STAINLESS STEEL housing with LARGE DIGITAL DISPLAY & removable BPA-FREE, dishwasher safe non-stick 6qt inner pot for instant, fast clean-up. ADVANCED SAFETY FEATURES. Equipped with multiple proven safety mechanisms & ETL CERTIFIED – Safe Lock Lid with safety valve will only open if pressure is fully released. 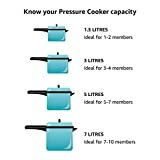 Can be used by beginners and professional chefs | HIGHLY ENERGY EFFICIENT: Save up to 70% of energy due to twin-layer insulation and shorter cooking times- your Hohm Pressure Cooker will literally pay for itself.